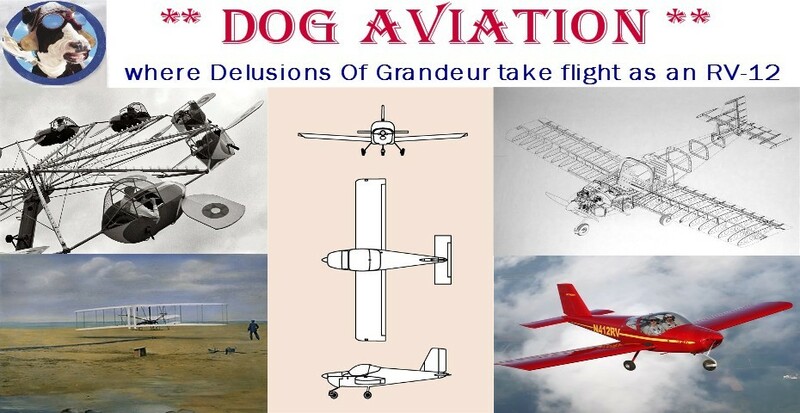 DOG Aviation John's RV-12 Blog: What To Do About The Heavy Wing? After installing the trim tab and prior to making a test flight, a seeming tool was used to ever so slightly flatten the aft edge of the “light “ (in my case the right) flaperon in the hopes of reducing the heavy left wing. This is the Van's suggested method for correcting the issue. Using a seeming tool with tape on the jaws to ever so slightly change the shape of the trailing edge of the right (light) flaperon. After making a slight adjustment to the right flaperon, the RV-12 was taken for a few loops around the pattern to see how well the rudder trim tab worked and if there was any improvement with the heavy left wing issue. I would have preferred to have flown away from the airport for an hour or so but there was an approaching storm front, so I just remained in the pattern for a couple of loops. Since I did not get up to cruising speeds, not sure if any adjustments to the newly installed trim tab will be required … but initial indications are the trim tab has helped quite a bit with correcting the yaw component. Now onto the roll issue. As for the heavy left wing, there was seemingly a very slight improvement, but the left wing is still heavy. So will need to delve into it a little more before bending more flaperon metal. Went online and did a little research on the VAF forums to see what others have done to resolve their RV-12 heavy wing issues. There was quite a mixed bag of solutions and combinations thereof posted by builders. Some involved adjusting the rod end bearings that support the flaperons to the wing, some involving adjusting the shape of the trailing edge of the flaperons and one in particular that caught my attention … adjusting the upper wing skin aft of the rear wing spar. I’m very confident my issue is not with a rod end bearing adjustment, because I was extremely fussy about making sure all the rod end bearings were screwed into the flaperons the exact same amount and went through great lengths to make sure the measurements Van’s gave in the plans were strictly adhered to, so I’m leaning towards ruling out making any rod end bearing adjustments at the moment. The one post by Tom, a RV-12 builder in Kentucky, that really caught my eye mentioned he noticed a small difference in the upper wing skins between his left and right wings in the area aft of the rear spar. Tom said reshaping the upper wing skins in this area solved his heavy wing issue. For those not familiar with the way the RV-12’s wing is designed, there is a rear spar that runs along the span of the wing and the upper wing skins overlap this spar by a couple of inches. This is done to present a smoother airflow to the upper surface of the flaperons rather than having a large gap between the rear spar and the flaperons which would create a significant amount of turbulence over the surface of the flaperons. Anyway, I used a straight edge to check this area and sure enough, there were differences between the two wings and even on the same wing. In some places the aft edge of the upper wing skins were high and some places they were low. So using the straight edge and a piece of plywood, the wing skins were massaged until the wing skins aft of the rear spar were fairly straight. The process begins with raising the flap handle to full flaps to open up the gap between the flaperons and the wing skins to make room for a block of wood. One can see in the following photos that at some locations the aft edge of the upper wing skins were low and other locations were high. Also of note, the amount of deviation was actually a lot more initially, but I began hand massaging the skins before thinking of taking any photos and using a piece of wood to really dial it in as close as possible. Here one can see the upper wing skin that extends aft of the rear spar is bent down at this location and needs to be raised. Using a piece of wood to flex the aft portion of the wing skin up to raise it a bit at this location. In this area, the upper wing skin aft of the rear spar it too high, as can be seen in this photo. With a lot of patience I was able to get both wings tweaked so the upper wing skins aft of the rear spar are now fairly consistent between the two wings and for the most part, flat aft of the spar. Will need to test fly the RV-12 and see if there is any improvement … I have a good feeling there will be a change, hopefully the one I’m looking for.